Kennebec & Moose River Maine Inns – Another great reason to visit Maine. The Maine capitol of Augusta is located in this region. Explore 12,000 years of history at the Maine State Museum and Capitol Building. Maine’s famous Belgrade Lakes region provides four-season recreation. Waterville is a busy college town, Colby College and Thomas College are located here. Meet a 62-foot tall Indian in Skowhegan. Kennebec & Moose River Maine has a fabulous selection of Inns, and Bed and Breakfast Inns to accommodate every budget and lifestyle. Please share your Maine Inn comments. 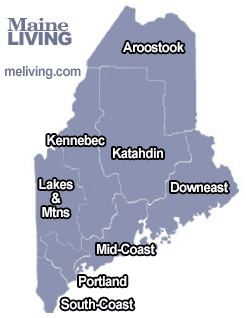 Thanks for mentioning to the innkeeper(s) you found them online in meliving.com – Maine’s Internet Magazine. Browse all of our suggested Maine Inns below. To feature your Maine Bed & Breakfast Inn, contact us. Enjoy the beauty of Maine. Find discount lodging deals at the best Maine hotels, inns and resorts. Book online, compare rates, read TripAdvisor reviews.